Besides the location in the "heart of Charleston", what do the luxury downtown condominiums 21 George Street and 76 Society Street have in common? Stretching from George to Society, they share not only their underneath gated parking garage (offering 1.5 parking spaces per condo), but also their homeowners- association and acclaimed management company which keep the buildings running efficiently with a sedate, stylish, and well-maintained atmosphere. High-end finishes including granite or marble to hardwood flooring and elegant kitchen cabinets in most of the condos, lend an air of refinement to an already attractive building. 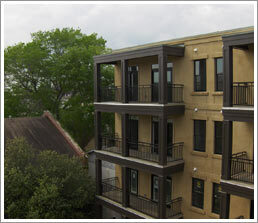 Some 2nd level condos have oversized terraces the entire width of the condos providing up to 900 sq. ft. of outdoor living space that presents views of the city skyline from every angle, while the 3th and 4th floor condos have balconies overlooking the cityscape views of the shopping district and some College of Charleston buildings. When you hear the words, "location, location, location", this is it, and more. Walk to everything! Situated right in the center of activity one block off King Street, leave that car in the garage while you indulge at your favorite gourmet restaurant or café, or check out the latest in boutique shopping just steps from your front door. Kick up your feet at the end of the day and relax before wandering out to the streets again to attend your nearby fitness center, local spa salon, or enjoy the arts and entertainment that only downtown Charleston can offer. This is a unique opportunity to live in downtown luxury at affordable pricing.